RockTape will once again take centre stage at this year’s Therapy Expo, holding their annual UK Movement Summit in partnership with Therapy Expo, offering unprecedented insight, dedicated demonstrations and hands on training in vital clinical skills including; kinesiology taping, IASTM techniques, movement screening, manual therapy and therapeutic movement and exercise prescription. The conference will take place in the dedicated RockTape Demo Zone theatre with content delivered by world renowned experts. 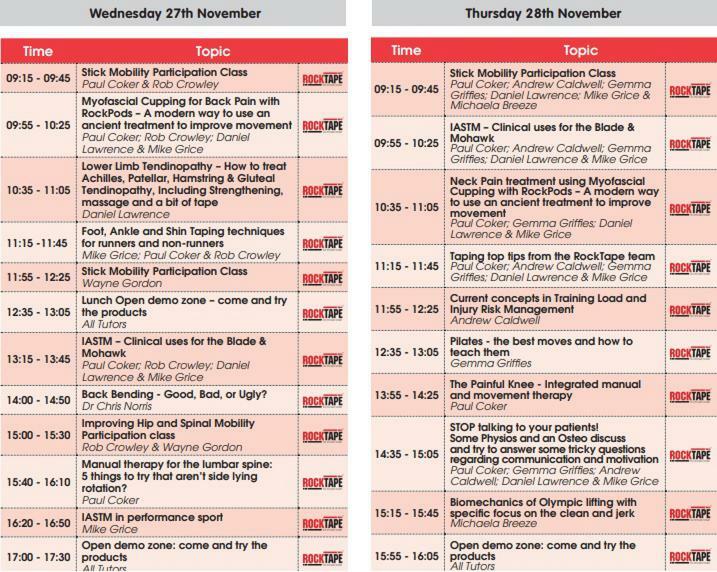 Promising to be the movement and taping event highlight of the year the RockTape UK Movement Summit will present a fantastic programme with world renowned speakers, demonstrations and hands-on workshops. Novice and experienced practitioners alike will walk away with new ideas and skills, and the confidence to put them into practise when treating their patients. Dedicated demonstrations and hands on training will cover vital clinical skills including; kinesiology taping, IASTM techniques, movement screening, manual therapy and therapeutic movement and exercise prescription.